Forget Taylor, never mind Miranda. Little girls out there who just want to pick up a guitar and rock like the boys need not look any further for a role model than Rosie Flores. 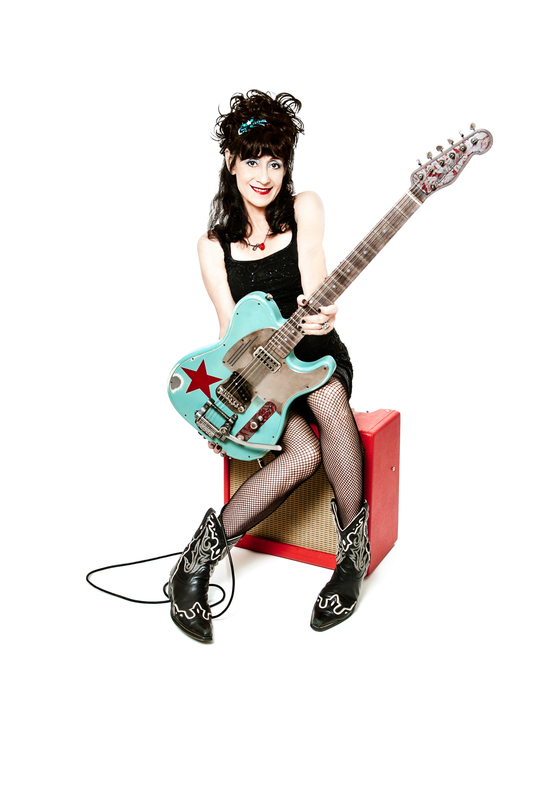 The "Rockabilly Filly," who's been making waves in a variety of underground and roots genres for several decades now, has managed to rave up, get down, shred, and surf on her axe with the best of them--earning respect from top names such as Bonnie Raitt and Jeff Beck. Flores started out in the mid-'80s as part of an all-female group, and made her solo debut in 1987, which led her to make solid footprints in the Austin, Los Angeles, and Nashville music scenes. Since then, she's gathered accolades ranging from an appearance on Austin City Limits, to the award of "Best Country Artist" by the L.A. Weekly. The city of Austin even declared August 31 "Rosie Flores Day" in 2006. As if Flores wasn't cool enough in and of herself, she has awesome taste in fellow artists--as she demonstrated by convincing '50s star Janis Martin to return to the studio and record a new album in 2007. Martin, who was dubbed "the Female Elvis" but then lost her record contract due to marrying and starting a family (take note, girls--you think balancing work and family is tough these days? ), obliged, created The Blanco Sessions in Texas, and passed away shortly after from lung cancer. We at Our Country had the chance to chat with Flores about her work with Martin, as well as her own long and groundbreaking career--including her new album (no. 11 in her catalog), Working Girl's Guitar. Our Country: You have managed to succeed and receive peer and critical acclaim in several music scenes that are very difficult for women to conquer: Alt-country, rockabilly, and surf. Can you put a finger on your key to success? What was the most difficult part of "cracking" these often male-dominated scenes? Rosie Flores: If I'm getting peer and critical acclaim I am very happy. I'm still trying to crack through, and it still seems impossible to conquer the music industry. The role of a lead guitarist has always been male-dominated for sure, but it's never been an issue for me. If anything, it's helped me immensely, to have been encouraged by males from the beginning when I rocked my first band at 16 years old. Even if one guy here and there said "Hey, you're pretty good for a girl," I always took it as a compliment because it made me feel pretty good. Growing up in San Antonio in the '50s when rockabilly was born, moving to California at the beginning of the surf craze in 1960 and being a strong part of the California Country scene in L.A. all gave me an "in" with each genre and those styles of music shaped me as the player I am now. Female lead guitarists are REALLY hard to come by. You obviously have the chops, but have you ever faced any notable challenges on the "respect" level? Or have fellow artists been mostly receptive? I'm especially lucky with the respect that I have gotten from other players and songwriters, like Lucinda Williams, who will rave on about my guitar playing during her show and then call me up to sit in. Bonnie Raitt, who I think is awesome, gave me a shout-out once. I even got to jam with Jeff Beck when I was 21, and after begging him to show me a few licks on the guitar, he said "What for? You know it all." It is the music industry who have overlooked me for years; it's been difficult because I have not been accepted as a serious artist, but I keep recording and playing because I love what I do and there are enough people out there who love what I do as well. So there it is, I'm still pushing on. On this note, a perfect example of challenges women face in music is Janis Martin. I doubt very many younger music fans have heard of her, or even knew there was a "female Elvis." Can you talk about her initial reaction when you approached her to return to the studio? What were her hesitations if she had any? What was she most excited about? I remember the night that I was scolded for not knowing who Janis Martin was by a girl I had met at a rockabilly gig in 1979. Her words were: "If you don't know who Janis Martin is, then you don't know anything about rockabilly." After I got her Bear Family reissue LP and started learning her songs, this gave me the opportunity to turn others on to her. I first got Janis in the studio after asking her to sing on my Rockabilly Filly cd along with Wanda Jackson, and realized that I had the power to help these ladies get back out there to sing to a huge audience of rockabilly fans. That was 1995, and I do not believe that they realized how many people still loved their early recordings and never forgot about them. It was astonishing to see their reaction from so many people young and old. I asked Janis if she'd like to go in and record a new album because I would be honored to help her do it, and her reaction was one of hesitation--I believe that she was not confident at the time. She may not have felt that she was ready, but the idea seemed intriguing to her and it took about 10 years before I got her in there. Boy, am I glad we did it when we did, and she was too. Still on this note, how do you feel about the state of country and rock music for women today? It's much easier for female artists to balance family and work these days--but still, so many of the top artists are pop, or if they are in country, pop-country, rather than traditionalists or alternative or punk or anything outside of the mainstream. Female artists are much more accepted than they were in the early days of the '50s and '60s. The mainstream needs to loosen up and take more of a reality check on what's out there that's good and what is real. You've released a considerable catalog of albums since the '80s. What do you think makes your latest set really stand out, or what are you proudest of achieving on it? I am proud of the fact that I went in with the idea of playing all the guitar tracks on my Working Girl's Guitar without feeling like I needed someone else to make me sound legit, ya know? I'm not sure I ever felt that I was good enough to cover all the parts myself. But I've been playing as a trio on the road for so many years that it finally became natural to just go in and record what it is that I do out there. I can write a surf instrumental, and play all the guitar fills and solos on my live songs in my shows, and actually like the way it sounds, and that is like so empowering after all these years. You have spent time in two (frankly) musically snobby areas: Austin and Southern California. Do you have a favorite? What are your favorite things about each? I like both L.A. and Austin each for different reasons. I find that the camaraderie of players in both cities are quite supportive and friendly. L.A. musicians and songwriters have a more serious career-mindedness; they things get done and fast. While Austinites take more of a laid-back approach on working out the kinks, which can be slower. However not rushing a project can give one more time to play around with the creative process, to nurture unique ideas and see where they might go. I have so many favorite songwriters. I don't have room on this page to name them all. I guess I'll name just a few that have influenced me most. Tom Petty, John Prine, Merle Haggard, Johnny Cash, Harlan Howard, Tammy Wynette, Lennon-McCartney, Rodgers and Hammerstein, Smokey Robinson, Carole King.